Jim came to see me at my desk. He comes to say “hi” on a regular basis and is constantly making sure the office staff have everything they need. He brings us the paper to read, or lets us know when volunteer groups arrive. 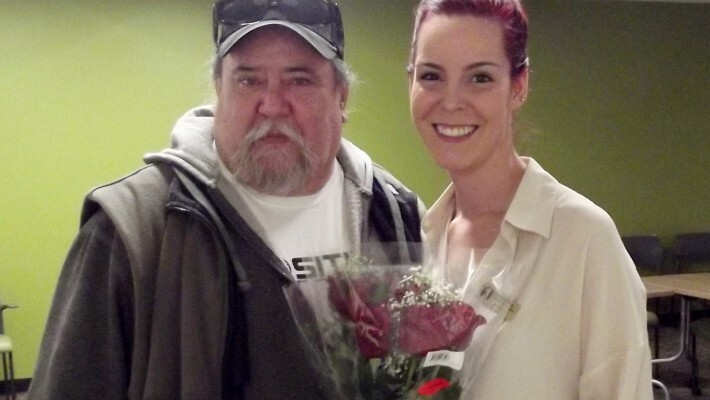 The photo above is from when he bought flowers for our receptionist, Melissa on her last day. Jim volunteers from time to time when he sees we are busy with no volunteers, and generally he helps out because he feels at home here. As it turns out, Jim is the 7th place record holder in the table top arcade game called Make Trax (it’s like Pac-Man). His score of 1,358,120 points earned him a place in the 1986 Guinness Book of World Record when he held the high score for Make Trax at the 1985 Masters Tournament. As I chat with our guests, many of them have stories like this, unique histories that we would never guess from just saying hi in the lunch line.